Thanksgiving Day has always meant something extra special round Ettersburg: Albert Etter was born on Thanksgiving in 1872 and died 78 years later on the same holiday. And because his "Experiment Orchard" contained a diverse assortment of chestnut seedlings and late-ripening apple varieties of his own invention, Thanksgiving became a favorite time for us to visit the old Etter place. Some thirty years ago - back when our children were growing up - we began making an annual holiday pilgrimage to the abandoned Ettersburg orchard; this became a way to honor Albert's memory and celebrate his fruit legacy. Even though the Etter ranch is only a few miles from our own place, the trek "over the river and through the woods" seemed like a big adventure for our young family. The road up to "Uncle Albert;s" was steep, narrow, winding, and in very poor repair. It was a long drop down to Bear Creek and our old truck had to work hard to get us to the top safely. We will always be grateful for the opportunity to explore this magical orchard in search of "new" apple varieties resulting from Etter's unfinished breeding program. Our journey was usually rewarded with pomological surprises and we always returned home with apple and chestnut samples to enjoy at the holiday dinner table. We made careful note of our favorite discoveries so we could return in a few months - pruners in hand - to collect scionwood for future propagation. Our Thanksgiving Day has likewise matured into a different style of commemoration. Instead of a pilgrimage, we now celebrate Albert's life/work by feasting on Etter apples which we are privileged to harvest from trees growing in our own orchards. Even in Northern California, the fourth Thursday of Novemeber is a bit late to be picking apples; the heavy seasonal rains that begin in October typically take a toll on late-ripening varieties. These are best picked in Early November and stored if necessary. Otherwise, a lot of good fruit will be ruined by rot and cracking. Despite this conventional wisdom, we choose to leave some fruit on a few Etter variety trees with the intention of a Thanksgiving Day harvest. Obviously, we are still attached to the holiday ritual. Over the years, we have learned which apples will hang on the trees in usable condition; these have become annual Thanksgiving fixtures. Our list includes seven Etter varieties: Crimson Gold, Waltana, Katharine, Pink Parfait®, Grenadine®, Jade™, and Vixen™. FOR CIDER: Any and all of these varieties can be blended into a flavorful cider; our personal favorite has become Vixen™. Like its better known, but smaller relative Wickson, Vixen™ combines all the robust elements (sugar,acid, plus a hint of tannin needed for superlative "vintage" cider - sweet or hard. Unlike Wickson, the Vixen™ hangs well on the tree into mid-November, developing intense flavor while withstanding rain damage. FOR SAUCE: Those of us who can't grow our own cranberries should be delighted to discover the potential of the Grenadine® apple as a convincing substitute. Peeled and diced into small pieces, then cooked with honey, Grenadine™ will produce a sauce that rivals cranberries in both color and brisk flavor. We have come to prefer it - and it grows on a tree in the home orchard. FOR SOMETHING COMPLETELY DIFFERENT; Crimson Gold is the principal ingredient in what has become for us a favorite holiday treat. When we first re-discovered this variety, its identity was confirmed by boiling it on the stove for an hour or so. As predicted in Etter's descriptive notes, Crimson Gold retains both its textural integrity - much like a cling peach. The flesh develops a rich golden color and the flavor remains excellent, especially when the cooking time is reduced to something more reasonable. Because the Crimson Gold hangs so well on the tree through November, we have come to rely on it as an appetizer or dessert. Peeled, cored, and cut in half, it then is poached in water with some honey (to taste). The result is beautiful, especially when served with a dollop of whipped cream or ricotta in the center. FOR DESSERT: Each of these varieties can be enjoyed fresh, depending on indiviidual taste. Grenadine™ may be a bit extreme for some. Texture freaks will be very pleased with Crimson Gold. For the discrning apple fancier, our most enthusiastic endorsements go to Katharine and Pink Parfait®, two of the most satisfying dessert apples we have ever enjoyed. Of course, any dessert might be a bit much after a holiday meal. This is the moment when a single Jade™ apple, small and austere, might be the perfect and refreshing finish to a long day of feasting. So let us use this festive occasion to say thanks to Albert Etter for his remarkable apple varieties. And our gratitude must also extend to all our friends and colleagues - local and global - who have encouraged and helped us in our work to sort out this gloriously complicated legacy. And finally, we must thank all our nursery customers who are growing some of these varieties in their home orchards; your stewardship insures that these extraordinary apples will endure. The future surely seems problematic.......and in difficult times, apples should remain a comfort us humans and many other hungry creatures. These are two of Etter's finest varieties, crab hybrids of exceptional dessert and culinary qualities. After more than half a century of striving for recognition, the Wickson is finally achieving stature in the marketplace. Unfortunately some growers have mistakenly labeled the fruit - and possibly nursery stock - as Crimson Gold. This is certainly not a happy situation for Wickson which deserves to be recognized and acclaimed by its rightful name. But the confusion may prove irrevocably fatal to poor Crimson Gold, which has struggled against extinction since its original - and botched - introduction in We urge anyone who has inadvertently participated in this name mix-up to correct the mistake as soon as possible. And we ask our nursery customers to spread the word: Wickson and Crimson Gold are different and distinct varieties; each is worthy of its own name integrity and identity. 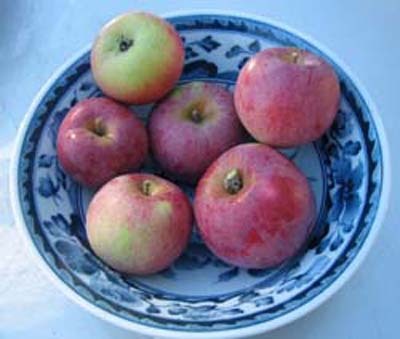 The fruit of Wickson is smaller and rounder in profile ; the dull red striping that overspreads the cream ground color is not as vivid. The flavor is very intense (high sugar/high acid) while the juicy flesh is somewhat delicate and fragile. It ripens in early October. Crimson Gold is typically about twice as large in diameter, with a flatter "oblate" shape; good-sized specimens are only a little smaller than a regular apple. Well-colored displays a deep, almost solid red blush, usually covered by a dusky bloom. Etter considered its broad calyx basin to be distinctively beautiful and jewel-like. The flavor is rich and robust - but not as overwhelming as Wickson's. Many would consider it more appropriate as a dessert variety. The texture - very crisp and crunchy - is especially memorable. It ripens about two weeks after Wickson and its firm flesh keeps well on the tree and in storage. Perhaps the best way to confirm Crimson Gold's identity is to subject the fruit to Albert Etter's notorious boiling water ordeal : Cut the apples in half and drop into a pot of boiling water. Continue to boil vigorously for at least an hour. If its the real Crimson Gold, it should emerge from this trial still solid and looking good or, as Etter might say, "like a golden cling peach." The Wickson Crab was the last of Albert Etter's apple creations to be awarded a patent; in 1947, almost three years after the original application was filed, U.S.Plant Patent #724 was assigned to Etter and his nurseryman/sponsor George Roeding, Jr. of California Nursery Company. While Wickson was always a personal favorite of the breeder, it took a fair amount of persuasion to convince CNC to invest in this non-crabby crab variety. Now, after more than a half century in commerce, Wickson enjoys the ironic status as Etter's most successful apple introduction, more widely planted and pomologically recognized than his larger varieties. The patenting process was not without its own confusing complications regarding the Wickson's genetic heritage. In the official patent papers, its parentage is described as "a cross between the Newtown and Spitzenberg crab." This inscrutable pedigree is obviously a clerical error most likely perpetrated by a legal secretary unfamiliar with pomological language. The garbled cross identifies just one parent , an obscure variety with the imposing name Newtown-Spitzenberg Crab. This compound name does not appear in any reference material. Nor does the name 'Newtown Crab'. Fortunately, W.H.Ragan's Nomenclature of the Apple (1905), a "catalogue of known varieties of apples referred to in American publications from 1804 to 1904 - " does list a 'Spitzenburg Crab' in its Siberian crab section; also of interest is a listing for a 'Sweet Spizenburg' crab which might well be the same variety. Ragan's entry, however, provides very little information beyond generic coding: Am (for American), m (for medium crab size) and vg (very good quality).The lack of further mention in the pomological literature indicates that the Spitzenberg Crab was already approaching extinction during Etter's breeding career. 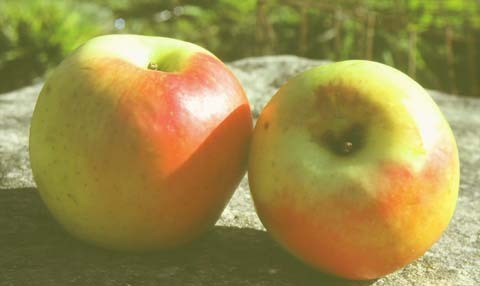 Moreover, it does not appear to have had any documented relationship to the larger, better-known Newtown Spitzenberg apple, which itself is entirely distinct from both Esopus Spitzenberg and Yellow Newtown Pippin. S.A. Beach's Apples of New York (1905) does describe the once important Newtown Spitzenberg apple, which by then was "going out of cultivation". But the mysterious 'Newtown-Spitzenberg Crab' is conspicuously absent from Beach's crab apple section, as is any mention of 'Newtown Crab' or 'Spitzenberg Crab'. The fruit of the new variety is comparable in size with the Newtown-Spitzenberg crab and resembles the Transcendent crab. It is not difficult from this to conclude that the variety misplaced by the patent attorney's secretary was most likely Transcendent Crab, a germplasm resource that Etter relied on heavily in his breeding experiments. In fact, Etter employed this well known crab variety as a parent for two of his other patented introductions, Etters Gold and Humboldt Crab. So here we have fairly clear model for straightening out Wickson's missing pedigree:( Newtown-Spitzenberg Crab X Transcendent Crab. Of course, we should bear in mind that Etter was not a trained scientist and did not always maintain accurate records of his experimental crosses; he was a gifted intuitive judge of fruit who had a clear vision of the qualities he wished to bring forth in his work. Regardless of parentage - the Wickson Crab stands out as the crown of Albert Etter's apple breeding legacy. Because of the mixed-up patent paper description, some recent books on apple varieties have given Wickson fictitious parentage data such as 'Esopus Spitzenberg crossed with (Yellow) Newtown Pippin.' This mistaken pedigree makes no sense to anyone familiar with the involved varieties. Once a mistake like this gets into print, it will likely be duplicated by reference works and repeated indefinitely. Much of pomological history has been plagued by published misinformation. Poor little Wickson certainly has had its share nomenclatural troubles. Fortunately, this unique, exceptional fruit has sufficient excellence to transcend the confusion and earn its rightful place in the pantheon of world-class apples of all sizes and heritage. The first European visitors to what is now called South America were delighted to find a tropical Bromeliad species - Ananas comosus - with large delicious fruit. When properly ripened, the new fruit was very sweet, refreshingly acidic, profusely juicy - and possessed of a memorably distinctive aroma. Both the fruit and plant specimens made their way back to Europe where the wealthy aristocracy welcomed a fresh addition to their tables and glass pavilions. In England, where the the apple remained the favorite domestic fruit, the new species quickly acquired the name Pine Apple, a title referencing its exterior resemblance to a very large pine cone. The Dutch pioneered the horticultural techniques for propagating and raising the pineapple under glass and these cultural practices came to England with the monarchy of William of Orange. By the late Eighteenth century, the landed British gentry focused a great deal of energy on growing their own fine fruits, including both the common ubiquitous apple and the luxurious exotic pineapple. The nomenclatural process came full circle when in the early 1800's the Williams Nursery of Pitmaston, Worcester introduced a local apple seedling derived from Golden Pippin which they named 'Pitmaston Pineapple'. A rather small conical fruit, the new variety combined an intense blend of sweet and sharp elements with aromatics suggestive of pineapple. The frequent presence of "watercore" - the physiological transformation of the apple resulting in translucent pockets of super-sweet flesh - enhances the resemblance. Scion of a prominent nursery family, Bunyard managed to rescue scores of fruit and rose varieties from horticultural oblivion and laid the foundation for what became the Royal Horticultural Society's National Fruit Trials (now established at Brogdale). His books The Anatomy of Dessert and The Handbook of Hardy Fruits did much to restore the epicurean spirit to British fruit connoisseurship. The name 'Ananas Reinette' translates literally (from the French) as 'Pineapple Princess'. In actuality, the term "Reinette" describes a class of apple that arose during the European renaissance which was esteemed as "fit for the princess". Over the centuries, perhaps 200 varieties in Europe were given the Reinette appellation as part of their name. Most are yellow or green apples - often tinged with russet - that are notable for high dessert quality, good acidity, crisp flesh, and the ability to keep well in storage. 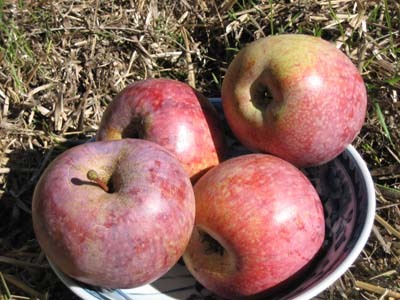 The American pomologist Quentin Zielinski included varieties like Yellow Newton Pippin, Fall Pippin, and Rhode Island Greening in the Reinette category; this, however may be stretching the nomenclature beyond its meaning. Though not well-known in the U.S., Ananas Reinette still enjoys some popularity in Germany. We first learned about it in Albert Etter's writings. Etter conducted a trial of more than 200 varieties, most of them obtained through the University of California extension service. He singled out Ananas Reinette as one of the best trial winners and ended up using it as a pollen parent for his experimental breeding work. We believe that the Katharine apple, a personal favorite of Etter's named for his wife, was derived from a Wagener X Ananas cross. Of all the pineapple-flavored varieties, Ananas Reinette is generally regarded as the most aromatic . Though not as intensely sweet as Pitmaston Pineapple, it is larger, later ripening, and longer keeping. Etter was not the only breeder to recognize its potential as a parent; the modern European varieties Freiherr von Berlepsch and Roter Ananas both derive their pineapple aromatics from Ananas Reinette. Two of our favorite Fall pear varieties are Magness and Warren. We use the number two with some ambivalence since many pear enthusiasts now believe them to be the same identical variety. They certainly do look and taste very similar. Nevertheless, there are some differences that need to be considered before this identity can be resolved; perhaps someday genetic testing will be able to solve this - and many other - nomenclature puzzles. The Magness Pear was introduced with much fanfare by the USDA in 1968. It represented the culmination of many years of breeding research that focused on combining high quality with resistance to pear diseases, particularly fireblight. The variety was named in honor of Dr. John R. Magness, the head of the USDA's apple and pear breeding programs for three decades. Dr. Magness was a vocal advocate for the"Best with the Best" approach to hybridization. 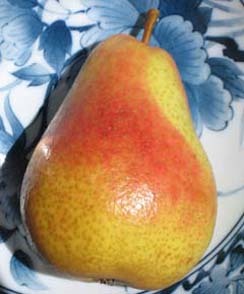 His namesake pear, derived from a cross of Comice with Seckel, serves as a fruitful example of this philosophy's potential for success. Some other notable instances include the apple varieties Jonagold and Spigold, both bred at Geneva NY. Dr. Magness' breeding theories, of course, were completely at odds with Albert Etter's notion that "wide" crosses would produce the most useful results. In 1936 Etter had sent Magness a sample box of his apple varieties, hoping to have them reviewed in the USDA's forthcoming Yearbook of Agriculture for 1937 that was dedicated to advances in plant breeding. Unfortunately, Dr. Magness chose to ignore both Etter and his apple varieties; he obviously could not bring himself to grant credibility to a self-taught, independent eccentric like Etter. Disappointed and embittered, old Albert came to view Magness as his personal nemesis: the man who symbolized the narrow-minded conservatism of the official pomological establishment. Ironically, modern plant breeders now tend to reject Dr. Magness; "the Best with Best" approach because it leads to a very narrow, dead-end genetic base. Instead, wider, wilder crosses are made to produce a generation of parents with more diversity; this can then be refined in further crosses to produce offspring that combine conventionally acceptable flavor and appearance with other critical qualities like disease resistance. In a sense, modern fruit breeding has hybridized the main stream philosophy of Magness with the more adventurous attitude of Etter. And now we introduce T. O. Warren and the Warren Pear to our story. Mr. Warren, of Hattiesburg MS, was a Founding Father of the North American Fruit Explorers (NAFEX), and one of its most beloved characters. He was a leading authority on practical fruit culture in the Deep South and helped countless novices learn how to graft and grow fruit trees under the difficult conditions of his region. 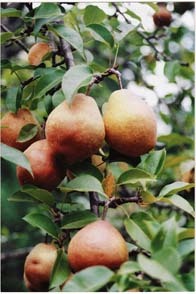 Around 1978, T. O. Warren informed his fellow fruit enthusiasts about a new pear variety he had discovered in an abandoned orchard in Mississippi. This Warren Pear not only distinguished itself with excellent flavor and attractive appearance; it seemed immune to the dread fireblight that plagues most pears and many apples in the South. Soon afterward, Mr. Warren began very generously to distribute scionwood of his new pear to friends, neighbors, and nurseries who were eager to give it a try. The Warren pear was well-received by home orchardists who were pleased by its many good qualities. 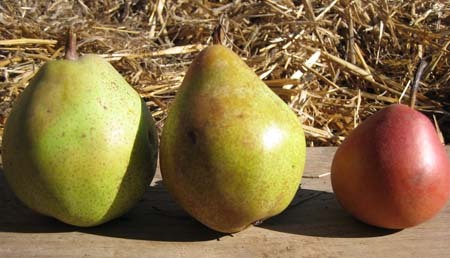 However, after a few years many pear growers began to notice that the Warren variety closely resembled Magness, and a rumor began to circulate that the two were identical. When questioned about the possibility that he mistakenly re-named an already established pear variety, Mr. Warren explained that the "abandoned orchard" where he discovered his new variety was actually the remains of a test site used by Mississippi State University. It seems obvious that the Warren Pear originated as a Comice X Seckel selection from the same USDA program that developed the Magness variety. So the question remains: Is the Warren Pear identical to Magness or is it a genetically similar sibling? And if Warren is a sister variety, is it distinctive and superior enough to justify its continued cultivation? 1. Magness is definitely pollen sterile and cannot fertilize itself or other varieties. This deficiency can make it somewhat slow to come into production and a shy producer in its first crops. The Warren pear appears to be self-fertile. 2. Though immune to fireblight in leaf and branch, the Magness has under extreme conditions shown infection in its trunk. This may not be a problem in most regions but is nevertheless a factor to consider. T. O. Warren's selection obviously survived under Mississippi's blight-favoring conditions and is probably resistant in both branch and trunk. The old homestead varieties of our local region all came from somewhere "Back East", so Humboldt County shares much of its apple legacy with places like New York and New England. 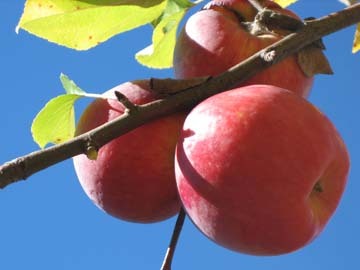 For example, Tompkins King, Esopus Spitzenberg and Baldwin were orchard favorites both here and in upstate New york circa 1900 and are still relatively easy to find on old sites in both regions. 1. The relative longevity of fruit trees here due to our benign climate. Trees are more likely to succumb to marauding bears or lightning than to disease and insect pests. 2. Southern Humboldt's period of settlement occurred relatively late, with many homestead orchards planted between 1895 and 1905. This coincides with the period when Hyde King and Northfield were in their heyday. 3. Both varieties were favorites of Albert Etter (1872-1950) and his brothers. Before Etter had created any of his own varieties, he was growing and marketing Northfield Beauty & Hyde King apples for the local trade. He also promoted them in his writing. 4. Greenmantle Nursery has been propagating and selling trees of both these varieties since 1982. While most have been planted in West Coast orchards, an increasing number are finding their own way to other parts of the country. We hope that someday Northfield Beauty and Hyde King will have a renewed presence in the apple orchards of their native regions. Around 1900, a young Albert Etter began his apple breeding career by importing scionwood for a couple hundred different varieties that he acquired with the help of the University of California. To conduct his trial, he grafted these onto seedling trees that had been planted out a few years earlier to serve as experimental understock; several varieties were typically grown on each tree. 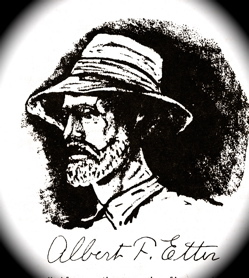 Etter's goal was twofold: First, he sought to determine which varieties were best adapted and most productive under Southern Humboldt's growing conditions so he could recommend them for commercial planting; Second (and most important), he was looking for varieties that could serve as genetic parent material for his subsequent hybridization experiments - aimed at creating new and better varieties. It took Etter nearly a quarter century before he had results from his apple hybridization work to report. Meanwhile, he busied himself with strawberry breeding, eventually introducing some 50 varieties and establishing himself as an important breeder. He also took the time to inform his Humboldt Co. neighbors of the most promising apple variety in his extensive trial: Northfield Beauty. There does not seem to be much information written about Northfield Beauty other than a brief, perfunctory description in Ragan's Nomenclature of the Apple. It originated as a chance seedling in the Northfield Mountains of Vermont sometime in the second half of the 19th century. Etter most likely obtained scionwood from the University of California Extension Service which had been founded by his friend and mentor E. J. Wickson ( 1843-1923). At this point in his career, Etter seemed to be following Dr. Wickson's example of recommending and promoting selected varieties for commercial planting. 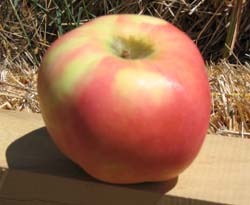 Etter ended up nominating Northfield Beauty as an important new variety for Humboldt Co. orchardists. Northfield Beauty ripens in the same season as Gravenstein - and Etter's endorsement focused on a comparison of the two varieties. Perhaps the biggest problem confronted by the Gravenstein orchardist is its unfortunate tendency to drop a substantial portion of its crop prematurely. This has led to many growers to harvest early - well before the fruit is really ripe; quality, even for cooking, is thus diminished. Northfield Beauty certainly does not suffer from this problem. It will hang on the tree almost indefinitely - at least until winter storms knock them off. All the while, the color becomes a deeper, more vivid shade of red with the skin protected by a waxy finish. Unfortunately, the flesh of a Northfield apple in December, though snowy white, is too mushy for human consumption (though bears don't seem to mind). Northfield Beauty has some other advantages. Most significant is its resistance to apple scab, a disease that blemishes Gravenstein - and many other varieties - when Spring weather is on the wet side. Furthermore, it blooms a bit later than its more famous competitor, making it a more reliable bearer in frosty orchard sites. Finally, as indicated by its name, Northfield Beauty is a very attractive, colorful apple that does well in the marketplace. Despite these virtues, Northfield Beauty will never replace Gravenstein in the pantheon of the world's great apple varieties. With regard to eating quality, no summer variety can compare with a well-grown, properly ripened Gravenstein. Northfield Beauty is a fine cooking apple - perhaps almost as good as Gravenstein - but for the dessert qualities of flavor and texture, it doesn't really compete. Regardless of Etter's hopeful rhetoric, Gravenstein is simply the best of its season. Having read about Etter's endorsement of Northfield Beauty, we began searching for an old surviving tree of the variety among the abandoned orchards of Southern Humboldt. Our efforts proved fruitless until a fortuitous encounter with a local old-timer who knew the variety and where to find it. He directed us to an orchard on property originally homesteaded by Emil (E.J.) Etter, oldest of the ten Etter brothers. The Northfield Beauty tree was easy to locate, its trunk leaning precipitously toward the ground, branches laden with brightly striped apples and tipped with potential scionwood. Locating this Northfield Beauty tree felt like a significant accomplishment at that moment. The thrill, however, was somewhat diminished by the realization that we had been ignorantly walking past several Northfield Beauty trees every time we visited Albert Etter's experimental orchard. 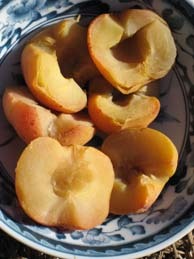 Our mistake came as a result of bad timing: we did most of our fruit exploring in the late Autumn (October-November). By then the Northfield Beauty apples were a solid, brilliant red on the outside; inside the white flesh had turned to a soft, flavorless mush. It was difficult to imagine that back in August this apple was in its prime, one of the treasures of the Etter orchard. In Humboldt County homestead orchards, there are two "Kings" : Tompkins King, the nationally renowned New York State apple variety famous for its super-sweet 'water-core'; and Hyde King, a local favorite winter keeper. Originally from the Midwest, Hyde King is now virtually unknown (and almost extinct) outside our region, These two varieties, though sharing the same last name, have little in common and show no obvious genetic link. Both, however, were highly esteemed by Southern Humboldt homesteaders. We are fortunate to have a fine old specimen of each variety on our place, planted by the original settlers circa 1895. Though still very obscure, the Hyde King apple has many virtues and deserves to be more widely planted. S. A. Beach, author of Apples of New York 1905, gave it his imprimatur with a full-page color plate; a singular honor for a relatively new and unknown variety. He opened his evaluation with this appraisal: "Hyde King appears to be one of the most valuable of the newer varieties of apples which have been tested at this (NY) Station." He went on to praise its beauty, size, keeping ability, vigor, and dependable bearing habit. While he does not rank it among the best dessert apples ("not high-flavored"), Beach rates it as good in quality and cites its merits as a culinary variety with promising market potential. Albert Etter was another big fan of Hyde King. Not only did he recommend it to others (his endorsement of the variety appears in E.J. Wickson's California Fruits) - he planted Hyde King extensively at Ettersburg. Even in the 1980's there were probably more trees of Hyde King than any other variety growing in Etter's old orchard. Their fruit comprised an important cash crop for the Etter family; they had a contract to furnish the hospital in Eureka (Humboldt Co. seat) with its annual apple supply. 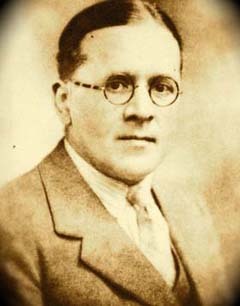 Being both an excellent keeper and cooker, Hyde King proved a very useful and profitable variety in the early 20th century. 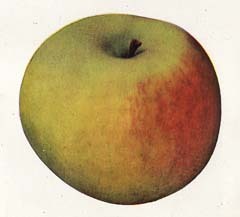 Considering its promising commercial potential, it is ironic that the Hyde King apple so swiftly faded into pomological obscurity Of course, it was not alone in this fate; countless fine varieties disappeared from the nursery, orchard, and marketplace during the first half of the 20th century. This sad trend cannot be explained away as an outcome of quasi-Darwinian "selection". It coincides with the industrialization of apple production and the increasing urbanization of American demographics. In this milieu, Hyde King simply could not hold its own against the avalanche of Golden Delicious apples cascading out of Eastern Washington. Times, of course, have now changed with regard to fruit connoisseurship.... Perhaps Hyde King deserves to be reconsidered for the home orchardist and small scale commercial grower. Because of its impeccably crisp texture and pleasant, but not overwhelming flavor, Hyde King will appeal to modern consumer palates better than most so-called 'antiques'. Indeed, it could vie well in the company of Mutsu, Fuji and Honeycrisp - modern varieties esteemed for hard, crisp texture combined with mild, sweet flavor. And the Hyde King might last longer under the primitive storage conditions of barn and cellar; this apple is truly a phenomenal "keeper." While California is highly esteemed world-wide for its excellent fruit crops, the apple has never enjoyed much recognition as a Golden State product. This despite the fact that california has long been a major producer of high quality apples and includes some of the world's best apple growing districts. The wave of Euro-American settlers that invaded California in the mid-nineteenth century were quick to plant orchards of apple varieties that originated Back East during the colonial period or in the decades immediately following independence. Varieties derived from New York and New England (Esopus Spitzenberg, Jonathan, Tompkins King, Rhode Island Greening) were especially popular in Northern California and survive to this day in abandoned homestead sites. And for whatever reason, there was never much chance for native apple seedlings to establish themselves in the fruit marketplace. Even as systematic fruit breeding became important in the twentieth century, the advent of California apple varieties never got off the ground. Luther Burbank(1849-1926) - without doubt the most acclaimed fruit hybridizer in horticultural history - focused very little attention on the apple: this despite the fact that his breeding grounds were located just outside of Sebastopol - California's great Gravenstein district. He did introduce the Winterstein apple, now virtually extinct due to its unexceptional quality. Meanwhile, there are a few old California natives that we might commend to the home orchardist and collector. They have proven themselves to be excellent in Northern California and should be worthy of trial in other parts of the country. In his early editions of California Fruits and How to Grow Them, Edward J. Wickson (1848-1923) appended his main list of apple varieties with descriptions of promising new seedlings originating in the state. Of the 14 varieties mentioned, only one seems to have made it into limited commerce. Though quite rare today, it is still prized by connoisseur apple collectors and propagated by a few specialty nurseries. We have come to regard it as one of the finest apples of its season (late August-early September). A distinctively beautiful apple, it combines large size with exceptional dessert and cooking quality. Skinner's Seedling is a genuine California pioneer variety, originating from seed carried by settlers migrating from Wisconsin circa 1850. The seedling tree grew near the banks of Coyote Creek on a site east of San Jose owned by Judge H. C. Skinner. Judge Skinner was obviously impressed with the apple's many virtues and campaigned to gain it wider recognition and planting, particularly around the Santa Clara Valley, which in those days was known for its extensive orchards rather than "silicon". In 1887 the American Pomological Society officially recognized Skinner's Seedling as a distinct variety. A decade earlier the "New Fruits" committee of the A.P.S. had evaluated it and ranked it as "the Best very large apple we have seen". Besides its official name, Skinner's Seedling has also been called Skinner's Pippin and Santa Clara King. Perhaps because of this last synonym, Skinner's Seedling has sometimes been described as a seedling derived from Tompkins King. We regard this alleged pedigree as highly improbable owing to that older variety' s well-documented triploid infertility. 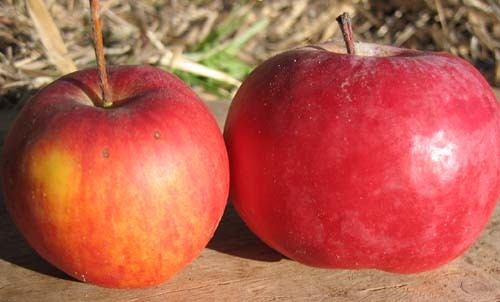 The two apples are both large, regal varieties - but bare little resemblance to each other. If anything, Skinner's Seedling has superior eating quality, with a more complex flavor informed by more robust acidity and richer aromatics. Back when we first started collecting apple varieties, Skinner;s Seedling was no longer available from nursery sources; furthermore, there were some suspicions regarding the trueness-to-name of selections circulating within the amateur fruit network. We were very fortunate to locate an authentic old homestead specimen growing in the Child;s family orchard at Redcrest, California. Its identity was confirmed by an old zinc label still legible after three-quarters of a century of exposure to the elements. Ironically, we have subsequently come across other Skinner's Seedling trees during our work to sort out nomenclatural problems with Albert Etter;s patented apple varieties. Several times, we have been asked to confirm the identity of trees purchased as Alaska and Etter's Gold from California Nursery Company in the late 1940's to early 1950's. In each case, the fruit turned out to earlier ripening, red-blush variety of surprising good quality that we were able to identify as Skinner's Seedling. The source of this mix-up became obvious when Bruce Roeding, who took over CNC from his father, furnished us with a map key of their original sourcewood orchard. The patented Etter/CNC varieties were interplanted in a block of established Skinner's Seedling trees. It would not be unreasonable to speculate that in order to save time and space the Etter scionwood was framework-grafted on mature Skinner;s Seedling trees. At any rate, as CNC went through hard times and fell into disrepair, varieties like Alaska and Etter's Gold were easily mixed up with Skinner's Seedling. While this mistake might have generated both disappointment and pomological confusion, at least the customers ended up with an excellent and very rare apple variety. The privilege of growing and eating Skinner's Seedling apples will always be fortuitous. Another indigenous California variety that deserves to be more widely known and grown is the Sierra Beauty, an outstanding apple that comes with an interesting story. According to old catalog accounts, it was found as a chance seedling, growing in the Sierra Nevada Mountains, 30 miles east of Oroville in Butte County; the discovery occurred around 1870. Twenty years later, it debuted as Sierra Beauty at Rancho Chico Nursery, an enterprise operated by General John Bidwell (1819-1900), an orchardist, nurseryman, and founder of the town of Chico. 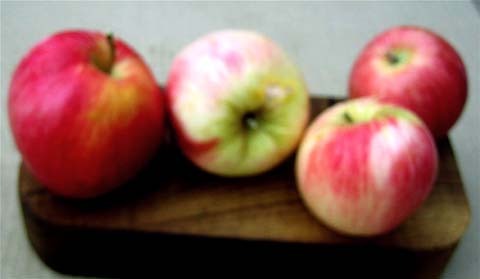 Sierra Beauty does earn its name; the apples are large and colorful with a creamy yellow background typically suffused by a beautiful crimson-red blush. The white flesh has excellent texture, at once crisp,tender, and juicy. The flavor is brisk with sugar and acid as well as strongly aromatic in a pineapple mode. It is a versatile apple, serving well for fresh dessert, cooked pies and sauces, and spritely sweet cider. It ripens here in October and stores easily for a few more months. Founded in 1851, Rancho Chico Nursery was the second oldest nursery in California. It was also one of the largest, its 1889-1890 advertisement claimed an inventory of 600,000 fruit trees and 200,000 grapevines. It did not, however, survive as an independent business into the new century. Instead, Rancho Chico Nursery was acquired by Oregon Nursery Company (ORENCO) which was well on its way to becoming "the largest nursery in the West". Sierra Beauty apple became another variety acquisition on ORENCO's formidable list of fruit tree offerings, where it continued to be marketed through the next two decades. After World War I, ORENCO suffered the consequences of its over-extended structure in a changing economy. And as ORENCO faded into oblivion, so did a number of its worthy but less well-known fruit varieties - including Sierra Beauty. Sierra Beauty apple seemed both gone and forgotten until a renaissance in amateur fruit interest began to unfold circa 1970. Larry McGraw of Portland Oregon, amateur pomologist and historian, became intensely interested in the fate of ORENCO' "lost varieties; he was especially curious about Sierra Beauty. Mr. McGraw went on to found the Home Orchard Society and inspired several protegés to help him in this quest. Fruit exploring expeditions were undertaken to the area around Chico, but no one seemed to find any traces of this virtually extinct variety. After a phone call to Mr. Gowan, we were able to obtain scionwood and have been propagating it ever since. It does very well here in Ettersburg, obviously enjoying our hot days and cool evenings. Compared to fruit grown in the somewhat cooler Anderson Valley, our Sierra Beauty apples show significantly more blush and a higher sugar content. It is becoming an increasing popular variety at farmer's markets and we recommend it with enthusiasm to home orchardists and small commercial growers. This is another relatively obscure family heirloom with some regional exposure that now seems destined for a wider audience. It originated as a seedling, selected by Peter Hauer (1859-1951), an apple grower based in Pleasant Valley nestled in the Santa Cruz Mountains. He named Hauer Pippin apparently to indicate a genetic lineage to Cox Orange Pippin; while this connection is theoretically possible, we do not detect enough resemblance between the two varieties to warrant any claim of parentage. Nevertheless, the Hauer Pippin is an exceptional variety with many good qualities. Its value remains appreciated in Santa Cruz County where it continues to be grown as a specialty orchard crop. It ripens very late (November) and keeps well, making it a good variety for the holiday market. 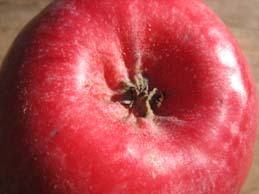 A small to medium apple, it is remarkable for its rich, deep red skin speckled with distinctive russet dots. 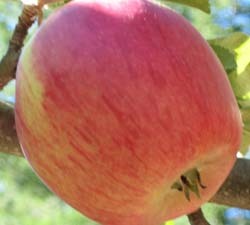 Because of its colorful appearance and late season, it has been dubbed "the Christmas apple" by some retailers. 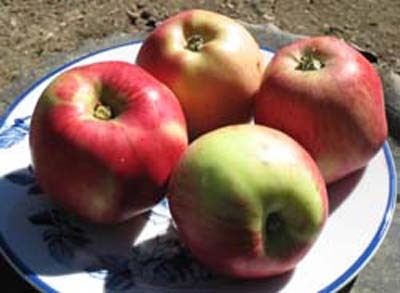 The Hauer Pippin has been a popular variety with California organic orchardists because of it resistance to disease and insect pests. It seems to be bothered less by codlin moth damage than most other apples. Its main drawback is the long, warm growing season required to ripen the fruit on the tree. Fortunately, quality improves during the first month or two in storage while the texture remains crisp. In the memory of our local old-timers, 2005 might have been the worst apple year ever. Unseasonably wet weather in the spring played havoc with blossoms and bees, disrupting pollination and fruit set. The result: little or no fruit. On Southern Humboldt orchard trees which managed to make some apples, the fruit typically was damaged by cracking and scab - not a pretty sight. So the few varieties that did make decent fruit that year definitely stood out in the orchard. Of all our apples, nothing could compare to Liberty for production and quality in 2005. We have always respected Liberty for its resistance to disease; in that year, with our attention more narrowly focused, we marveled at its virtues for dessert and culinary use. One of the first modern varieties bred for disease-resistance (scab, mildew, cedar apple rust) - Liberty may be the best of its "class". It derives its quality from Macoun, the seed parent and itself an excellent offspring of McIntosh introduced by Geneva in 1923. While Macoun shows some ability to withstand fireblight, most of Liberty's exceptional disease-resistance traces back to its less famous parent, PRI 54-12. This important progenitor from Purdue is genetically complex and gets its tough genes from a crabapple hybrid left over from a pollination experiment. 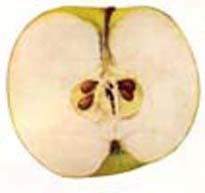 So Liberty's genetics represent a successful refinement of the controversial approach to apple breeding advocated by Albert Etter: "wide" crosses utilizing "primitive" germplasm. When introduced back in 1978, Liberty was the first high quality variety to incorporate comprehensive resistance to common apple diseases. Thirty years - and many disease-resistant introductions later - it remains the best. It ripens in October and keeps well, becoming mellower in storage. We recommend it to organic orchardists everywhere, but particularly for growers struggling to produce "clean" apples in regions plagued by high humidity.